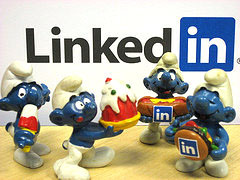 Targeting PAST experience on LinkedIn – can it be done? I recently had a recruiter ask me if there were any way to be able to search LinkedIn for people who have worked at a specific company in the past, but who are NOT currently working for that company. I can see why some Sourcers and Recruiters would want to specifically target people who are not currently at a company, but have worked there in the past. I’ve done a bit of digging on this, and I have yet to find a way to reliably targeting past experience while ensuring that you only get results of people who are not currently working at the target company. When searching within your network on LinkedIn, as you may know, the only controllable option you have is to be able to search for people who are currently at target companies. If you leave the “current companies only” option unchecked, you will get results with a mix of people who are currently employed at your target company as well as those who are no longer working there. Also – when searching inside your own network – you are limited to results of people to whom you are connected up to the 3rd degree. Going beyond your own LinkedIn network, you can try using Google and other Internet search engines and employ the site: command to search into LinkedIn – but we have to be aware that this is not a method that affords you precise control over current or past experience. However, I’m going to give Google, Exalead, and AltaVista a thorough LinkedIn Boolean workout. When you execute the search, you’ll see that it pulls results of people who are currently working at Lockheed Martin as well as people who have worked there in the past. Not really different from attempts made searching within your LinkedIn network – with the exception that you will likely find more people since you are no longer limited to the size of your personal network or LinkedIn’s limit of 500 results. I thought of using Exalead (www.exalead.com/search) in an attempt to exploit the fact that Exalead recognizes the NEAR proximity operator. Using the NEAR operator, we can try to force certain words to be close to the word “past” or NOT in their current position in an effort to try and search people’s past experience specifically. This is not an exact science, but it’s worth a shot. Checking the results, you can see that it works relatively well, but not perfectly, mostly due to the structure of LinkedIn’s profile page – current and past experience are listed so close together that trying to use the NOT/- operator in conjunction with NEAR will cause problems, such as eliminating results we actually want. FYI – Exalead does not appear to recognize “-(current NEAR Lockheed)” exactly as it does “NOT (current NEAR Lockheed).” Running searches back to back switching out the – and NOT yield slightly different results. This search seemed to work well – better than the above search, in my opinion, and it’s interesting to note that a good number of the page 1 results have profiles of people who have headers stating they are currently at Lockheed, but when you scroll down to their experience section, they are in fact, not currently working at Lockheed. So this search string worked relatively well. Now that we’ve given Exalead a workout, I figured I would turn to an old favorite of many – AltaVista. Strangely enough – that search only returned 6 results. The first result is odd because Lockheed is definitely mentioned within 7 words of Lockheed, but the rest seem to be good results – people who are not currently at Lockheed. However, 7 results is a little on the small side. FYI – it appears to run identically with or without parentheses. However, switching between the – and NOT where we have (current ~~7 Lockheed) does change the results – not just the number, but the actually results themselves. Odd. That yielded only 2 results on AltaVista vs. 61 on Exalead – so Exalead maintains its lead, pun intended. Alright – time to try and get Black Belt on AltaVista. I attempted to invoke AltaVista’s power of proximity AND order – trying to find profiles that mention Lockheed but not Lockheed mentioned before the word “past,” which, according to the standard LinkedIn profile structure (assuming everyone uses it, of course) would mean they are currently at Lockheed. Trying to prevent “Lockheed” from showing up before the word “past” SHOULD work based on the majority of the LinkedIn profiles I have seen. This did work – but it yielded only 12 results and some of the people do currently work at work at Lockheed. I then tried to prevent “Lockheed” from appearing before the location on the profile – which is a field/area where, if utilized, is where many people list where they currently work. And now…let’s give Google another shot. While Google does not support proximity searching in the form of the NEAR operator or configurable proximity (shame on you Google – really), we can try to approximate proximity searching by making use of Google’s single word wildcard operator – the asterisk. That search ran and yielded what appears to be the exact same 106 results – so spacing the asterisks does not appear to have any different effect, at least in this specific case. Perhaps Google’s single word wildcard asterisk operator doesn’t work well when combined with the -/NOT operator. Has anyone else experimented within combining them? If so, please let me know. Well, I hope you enjoyed this exercise in attempting to isolate and target profiles of people on LinkedIn who have worked for a company in the past, but are not current employees of that target company. I know I learned a few things along the way – that Exalead does a good job with proximity via the NEAR operator, that some of AltaVista’s proximity operators (NEAR and before) don’t seem to work as well as they should, and that Google’s asterisk operator doesn’t seem to play nice with the NOT operator.